And that is only when you take into account the feet. The Labanotation system (developed by professional dancers) has a graphical element for each movement of the legs and arms. 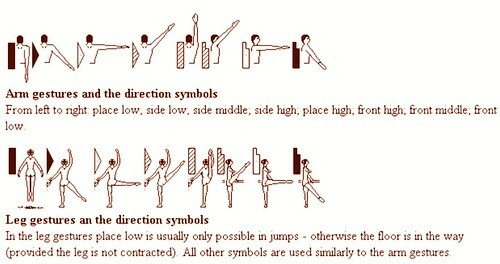 While this is probably one of the best systems around, it’s too complicated for us laymen dancers. 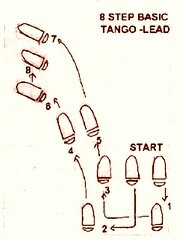 So I decided to distill a base vocabulary for writing down tango steps: Tangotation. Every step is described as a sequence of at least 3 letters: WLF is ‘woman (follower) – left (foot) – forward’, MRS is ‘man (leader) – right (foot) – sideways’. In WLBX, the extra X stands for ‘Cross’/’Cruzada’ (foot crossed in front of the other). Each letter has one unambiguous meaning, the full Tangotation alphabet is here. This is just a first draft, so all input is appreciated! But what do you use to indicate rotations? For exemple, in the central part of a “left turn” the man’s feet don’t move, just the body does. Nice work, and a lot of it, I’d say. But how do you notate expressing the music? Connecting with your partner’s feelings? Perhaps some things must be felt, not notated. 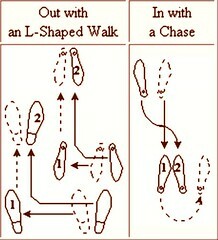 To start dancing tango for a guy is daunting, and any tool that helps to remember the base steps is welcome. Once you get further, the limitations of a notation system like this become unsurmountable. So yes, all your remarks are true, but they only come into play once a dancer is a lot further. 1. In your example short and long base step notations, in step #8 the lead step is given as MRC. I was puzzled as it is the man’s left leg that is closed to the right leg in the dance. Is this a typo or can you clarify please? 2. How would you notate the Hero sequence?